Shade Loving Perennials - You May Not Have Heard of Before. Learn about 7 easy to grow shade loving perennials, a little out of the norm that you will definitely want to add to this years wish list for the garden. I have a good deal of shade on my property. My home was built in the mid-eighties so much of the original landscaping is mature, including the trees which offer quite a bit of shade. This is great for our electric bill in the summer, but not so great for someone who wants to grow sun-loving flowers and vegetables. That being said I have found many great plants that work well in the shade. Here are seven shade loving perennials which are not the run-of-the-mill plants, which just might work for your shady areas. Lungwort is a perennial that comes up early in the spring. I love the blue flowers. Check out my article on lungwort from last year to learn more about its name and habits. I have this beauty in two spots. The first one is located is heavy shade, under a dogwood tree, next to a pine. The other is close to our foundation in the back of the house. They both perform well, and last throughout the season with dainty flowers in the spring. This can be invasive but I haven’t found it to be an issue for me. I really love the blue flowers and the nice mounding habit that fills a space nicely in the garden. This is a variety with very dark leaves which I like, and sometimes use in flower arrangements. It blooms in late summer when many of my other plants are fading, with bright golden flowers. This is a ground cover that seems to grow anywhere. The gold flowered one was here when we bought the house. The second one I often buy for containers as it trails nicely and will bloom on my shady front porch. This sweet perennial has pretty red rimmed heart-shaped leaves and cool yellow flowers early in the spring that are supposedly shaped like a bishop’s hat. This last one is more well-known but great for the shade. In fact, the Japanese painted fern was named Perennial Plant of the Year in 2004 . It grows well even among the roots of our huge red maple. You can see it here enjoying the tight space with sweet woodruff. I hope you enjoyed this handy list and maybe now you’ll have a few new shade loving perennials to add to your shopping list. I live in Hamilton, Ontario and in this province, it is legal to take Trillium (our provincial flower) from the wild, as long as you dig up the root and all. Other than that, we find them at botanical gardens annual sales – in white, soft lavender, deep purple and deep yellow. I’ve never found them at nurseries. I too have shady areas in my yard but still want pretty plants there (especially one’s that bloom). I’ll keep the plants you highlighted in mind. 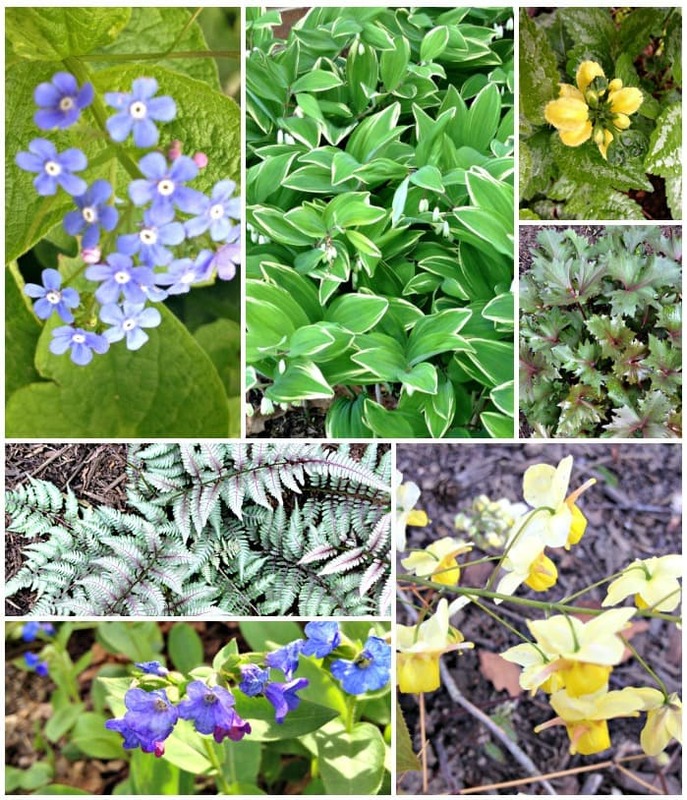 There are way more plants that do well in the shade other than hostas! I have a plant in my shady section that I love! A few years ago I purchased a few trilliums. They are pretty and remind me of walks in the forest. Please note that in most areas it may be illegal to transplant these from the wild. Make sure you purchase nursery grown! They seem to sell out fast though. If you see them in a catalog, grab them! Great color pallet. We have a similar problem with our front, it’s north facing so also really cool Thanks for the tips will take your advice.